2011 Canada Wildlife Series $5 Timber Wolf 1oz. Fine Silver Bullion Round!! 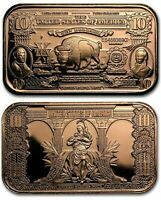 Bison $10 Dollar Banknote 1oz. Pure Copper Bullion Bar!! BitCON 1oz. Pure Copper Bullion Round!! Hel, Goddess of Death 1oz. Pure Copper Bullion Round!! Cannabis - Medicine 1oz. Pure Copper Bullion Round!! Immediate payment of C $125.17 is required.